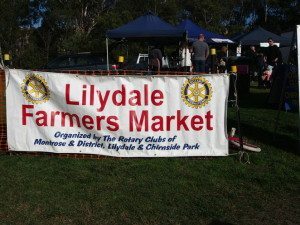 The Club continues to be involved in our local Communities, having representation on Lilydale Youth Club Committee, Mount Evelyn Township Improvement Committee [METIC], the Lilydale CCTV Camera Safe Project Committee and local police. 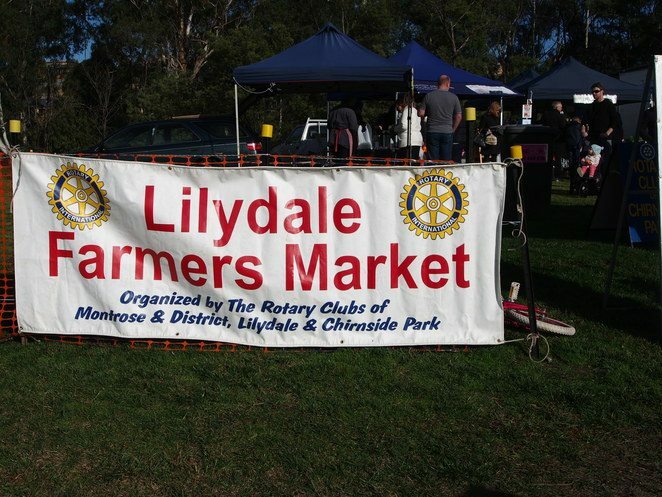 Lilydale Farmers Produce Market was a joint initiative of the Rotary Clubs of Montrose & District, Chirnside Park and Lilydale, which started in March 2009. 2. at the same time raise money for club local and international projects. The market and its stalls continue to evolve, with stall numbers averaging 25+, covering fresh vegetable produce, seasonal fruits, small goods, jams/chutneys, olive oil products, spices, breads & cakes. Gold coin entry plus stallholder site fee have contributed to raising over $146,000.00, as at February 2017. These funds have been distributed back into the local and international communities via various Rotary projects. The initial distribution were following the 2009 Victorian Black Saturday bushfires, with funds goingt to the  local CFA brigades to assist with upgrading or replacement of necessary equipment. 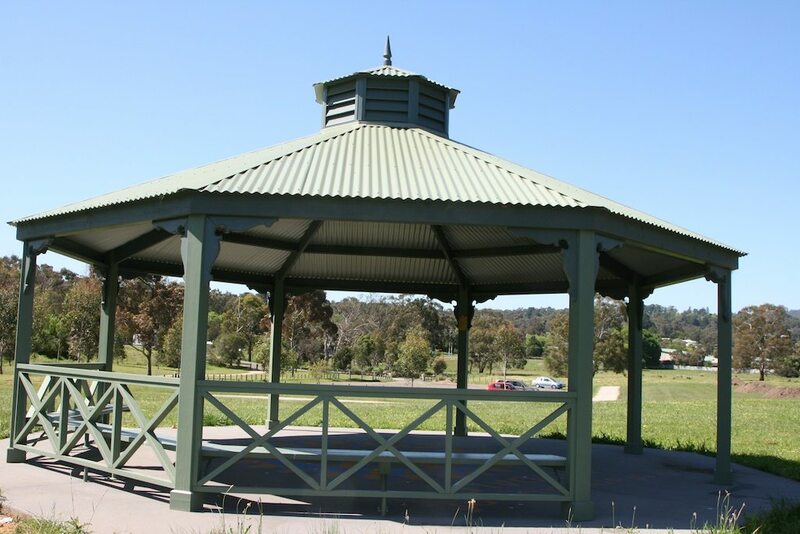 Located adjacent to the popular Lillydale Lake, and very visible from Swansea Road, the market is becoming a focal Community meeting place for locals, many with their dogs, to catchup with one another and have a coffee and chat in under cover facilities. In Rotary year 2012 – 2103, The Rotary Clubs of Healesville, Wandin, Upper Yarra and Lilydale jointly funded a community policing vehicle which is used throughout the Yarra Valley by our Community Policing Officers. The vehicle and its drivers are out and about in the Community for year 10 driver education programs and road safety, conducting Mental Health First Aid Courses, attending seminars on Elder Abuse, and meeting with Yarra Ranges Council Youth Services Officers. 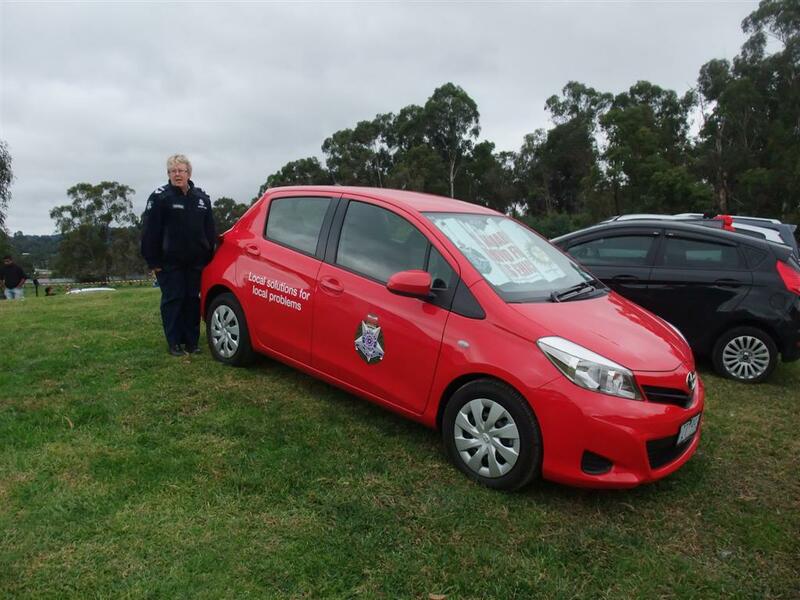 Additionally, the car is used to assist Community Police Officers in visiting the elderly, and providing information about safety and security in helping older persons on how to live confidently in the community. 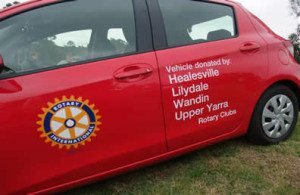 The Rotary Club of Lilydale continues its financial support for this vehicle. Over the years the Club has taken an active involvement in the Bi-centennial Lillydale Lake development. Club members have been actively involved in projects that have provided a range of infrastructure facilities for public use as well as planting out Arboretum areas in May 1996 to commemorate 30 years of Rotary service to the local Communities . 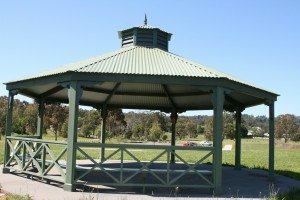 Facilities include a number of shelters, jetty near wetlands, seating around the Lake, water tank for toilet facilities, fun and fitness track and more recently a large Gazebo in the nearby Bellbird Park area. 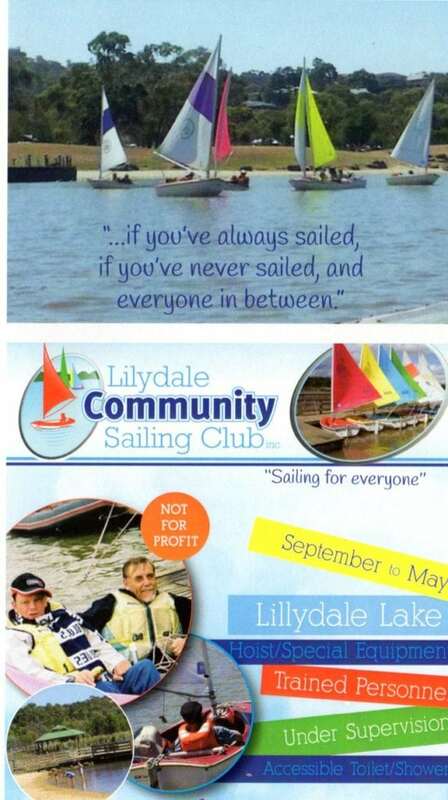 Lilydale Community Sailing Club exists to introduce people of all ages and abilities to the joys of sailing in an easy to understand, fun and inexpensive way within a supportive environment. to the LCSC to purchase a specially built boat. construction of boat racking within their Club Storage Facilities. many of who have a disability. Member of the Rotary Club of Lilydale. The Club has had committee representation on the Youth Club management Committee for the past 15 years, providing assistance in the direction of youth programs. Additionally the Club has provided much needed equipment facilities for use within the Club. During 2016 Club members undertook a major refurbishment of the gymnasium and boxing facilities within the Club rooms. Full particulars of this can be viewed on the following link https://www.rotarylilydale.org.au/2016/03/lilydale-youth-club-refurbishment/. 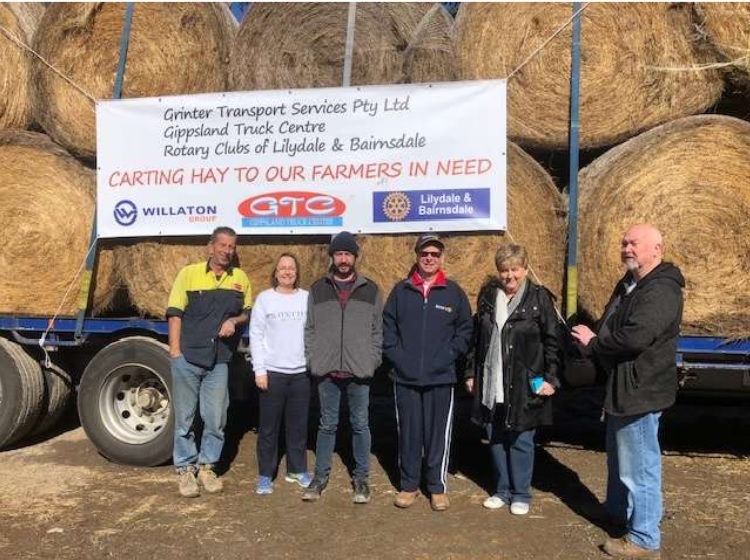 As of the beginning of February 2019, the Rotary Club of Lilydale has delivered hay, as well as grain, dog food and food vouchers to the Bairnsdale Community. The Club’s initial distribution of $10,000.00 for hay, has grown to a value of circa $54,000.00, all from donations to the Club. Following local press coverage, the Club has received from local community members, farmers and businesses, not only donations of cash, but food and other items, including hay bales plus the critical transport of these items to Bairnsdale. The latest hay donation has been 100 bales of hay from a Gruyere Farmer. This will bring us to our 8th delivery trip to be organised. 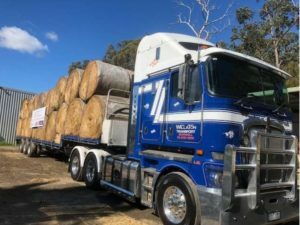 A big thank you to the local communities, the farmers and the generous trucking companies in providing some relief in the Bairnsdale area. 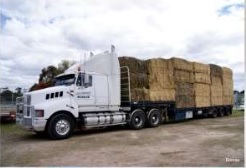 Subsequent to the above further hay has been donated by local farmers, bringing the total to 400 bales. 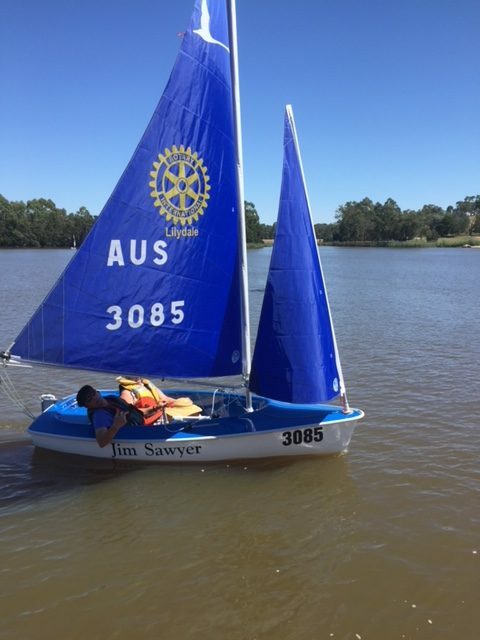 In addition this has been the catalyst for the Rotary Club of Bairnsdale to become pro-active with their local community getting behind them and assisting with fund raising in dollars and kind. AUSTRALIAN ROTARY HEALTH (ARH) is a national, not-for-profit organisation which funds health research and provides community education about health in Australia. The organization supports work on a broad range of health problems, but specializes in mental health. Our Club has been an active supporter of Australian Rotary Health through regular funding contributions and also via running Mental Health Forums to promote these issues and treatment to the local community. Bowel Scan is a public awareness program seeking to increase community knowledge of bowel cancer and its symptoms as well as the distribution of faecal occult blood testing kits to facilitate early diagnosis. The Club supports the annual Rotary sponsored Bowel Scan month, by initially co-opting pharmacies into the program, co-ordinating local publicity and then arranging the collection and despatch of used kits for testing. 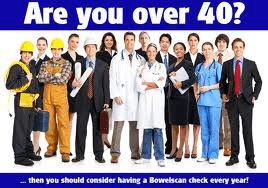 • emphasise the importance of bowel cancer screening for both men and women over 40 years. Bowelscan is a not-for-profit initiative. The successful operation of Bowelscan, and its accessibility to a wide range of people, is made possible by the voluntary support of a large number of pharmacies, pathology laboratories and Rotary members. We thank all involved for their contribution. 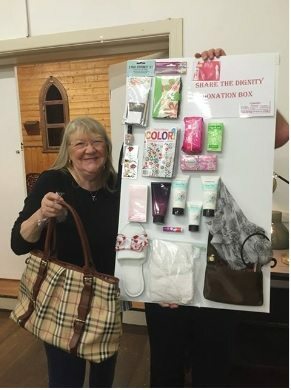 Sharon Chuck is coordinating the ‘Share the Dignity’ donation box appeal through the Lilydale Rotary. The aim of the project is to collect items that women require for daily use. Once collected they will be put in a handbag and given to needy people such as in refuge centres in time for Christmas. This will co-ordinated through local pharmacy shops. 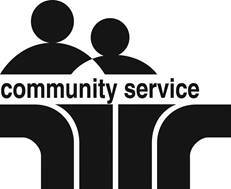 This is a great local community project – helping needy people in our own backyard. A very successful Club Project. delivered to 17 Safe Houses, resulting in many surprised and grateful recipients. FUND RAISING Club members, working in teams, have been involved in the annual Salvation Army and Red Cross Door knock appeals. SCHOOL SUPPORT Club members are involved in community planting programs at local schools, along with the Club financially assisting in travel costs associated with the school participating in music/band competitions. Over the last couple of years the Club has been actively involved in the promoting and providing assistance with the successful Yarra Hills Annual Art Show. MELBA SUPPORT SERVICES Club members are involved in garden projects, as well as providing BBQ / Sausage Sizzle facilities at Annual Fairs. BBQ / SAUSAGE SIZZLES The Club regularly supports Council and school initiatives with the supply of well-cooked sausages etc. Additionally we use these as a source of revenue raising, via participation at Bunnings etc. MT. EVELYN STREET PARTY A Biennial event in which the Club assists with Event Planning, Traffic Control, and providing a food vendor outlet. PARTNERSHIPS Assisting other Rotary Clubs and Community Groups, with provision of resources to assist with their projects and fund raising activities. e.g Installation of a light box for the night-time illumination of the Australian Flag in the recently refurbished Mt. Evelyn War Memorial, for the Mt. Evelyn RSL. The Club was actively involved in obtaining government grants http://issuu.com/starnewsgroup/docs/2014-02-04_mte_341/1?e=0.to instal commerative storyline displays concerning ANZAC Centenary milestone events in the area eg MilitiaTraining Camp under control of General John Monash at Lillydale Lake and mock battles at Mt. Mary Coldstream. Our Club continues to support the development of public CCTV coverage within the local communities to assist police in making our communities safer. PROBUS CLUBS Our Club has sponsored local Probus Clubs in order to provide regular opportunities for active retirees to meet and keep their mind active, as well as expanding their interests and enjoying the fellowship of new friends. Local PROBUS Club/s meet at The Lillydale Lake Community Rooms.